Manchester United coach, Sir Alex Ferguson have stepped up his interest in Atletico Madrid Star forward Radamel Falcao after he sent scouts to watch the Colombian, who scored twice for his club on Sunday night. It was reported last week that Ferguson is considering a £47million deal - that could involve Javier Hernandez as part of a swap - to land the former Porto goal poacher. So while Manchester United won 2-0 at Stoke, Chief scout Jim Lawlor watched Falcao strike a brace in their 5-0 thumping at home to Granada. 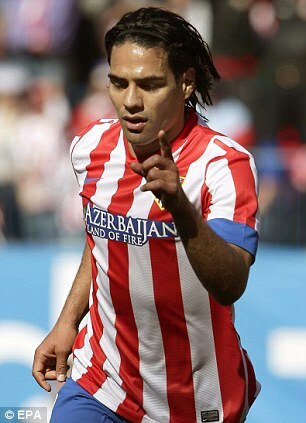 Manchester City and Chelsea have both been strongly linked with Falcao, who has established himself as one of the world's most prolific marksmen by scoring 56 goals for Atletico since arriving in Spain from Porto in 2011. But it is United have now joined the bidding for the 27-year-old Colombia star and are prepared to let striker Hernandez move to Madrid as part of the deal.